Is there a great spiritual tradition that deals with the contemporary issues facing the human community? In her new introduction to the Rule, Joan Chittister boldly claims that Benedict�s sixth-century text is the only one of the great traditions that directly touches today�s issues: stewardship, conversion, communication, reflection, contemplation, humility and equality. 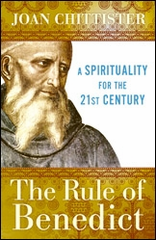 Tracing Benedict�s original Rule paragraph by paragraph, the new book expands the principles of the Rule into the larger context of spiritual living in a secular world and makes the seemingly archaic instructions relevant for a contemporary audience. A new foreword, updated content, an appendix, a Gregorian Chant download and a recommended calendar for reading the entries and commentaries make this an invaluable resource for solitary or communal contemplation. FROM OUR READERS: As a retired Episcopal priest I keep a modified Opus Dei, using the New Zealand Prayer Book offices and supplemental devotions, like your Rule of Benedict:A Spirituality for the 21st Century. THANKS so much for your insightful, wise commentary on the Rule in daily doses! This is now my 3rd time through the annual cycle, and like Scripture, it enriches my heart at every use.You continue to be a blessing to many of us, Sr. Joan, with your compassionate and justice concerns drawn from our common Benedictine tradition. Thanks again! �Fr. Bob S.
I had to let you know this, even though it happened three months ago. I visited my local Barnes & Noble shortly after Pope Benedict XVI announced his resignation. There I found a table with a selection of books written by him, obviously to capitalize on current events. As I scanned the book covers, suddenly I noticed a copy of The Rule of Benedict by Joan Chittister on the table. I had to laugh.... I wondered, "Should I go be a good Catholic and explain the mistake to the staff?" No, I decided that maybe someone might buy it�however mistakenly�and find not only the wonders of Benedict's Rule, but Sr. Joan's gifts. �D.L.